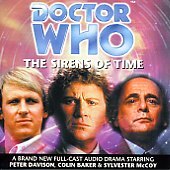 Appearances: "The Sirens of Time". History: The Sirens are rather similar to their Greek namesakes in that they 'sing' people into danger; however, while the Sirens of Greek mythology did this to lure sailors to dangerous rocks so that they could then eat the sailors, the Sirens of Time 'sing' time travellers, or people in general, into locations where they can change history, thus providing energy for the Sirens to feed on from the distortions in history. They eventually struck The Doctor in three times simultaneously, the Sirens luring three incarnations of The Doctor - the Fifth, Sixth, and Seventh	Doctors specifically - to three different locations in history; the Fifth Doctor found himself on a British merchant ship, which was sunk by a German U-boat, the Sixth found himself on the starship Edifice, orbiting a gaseous spacial anomaly called the Kurgon Wonder, and the Seventh found himself on a planet designed to act as a prison planet for the war criminal Sancroff, now just a crippled old man who acknowledged that what he'd done was wrong. Under the manipulation of the Sirens, who prevented The Doctors from leaving before they made any changes by locking them out of their TARDISes, The Doctors each made subtle changes to history. 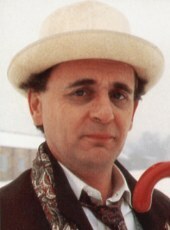 Thanks to the Seventh Doctor's intervention, Sancroff never died, and the Knights of Velyshaa - a race of lethal warriors, of which he had once been a member - were able to rescue him to lead their second campaign of conquest. The Fifth Doctor's attempt to return to the TARDIS forced the U-boat off course and prevented it from sinking the Lusitania; although the course of the First World War remained largely unchanged, a petty criminal who otherwise would have died on the Lusitania went on to kill Alexander Fleming in a botched robbery attempt before the discovery of penicillin, thus leaving the Earth ravaged by new strains of pneumonia and meningitis in 1956, and the survivors never discovered space travel and never defeated the Second Velyshaan Empire. 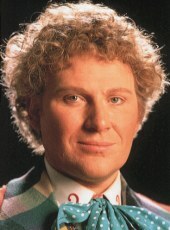 And the Sixth Doctor, by freeing the Temperon - a legendary time beast that had escaped attempts to control it by freezing the moment of its own death - also freed the Knights who had been trapped with it, enabling them to complete their experiment, acquire the power of time travel and thus conquer Gallifrey. However, this wasn't as easy as it seemed; for one thing, the only working TARDIS on Gallifrey had a burned out time core. The Sixth and Seventh Doctors decided to free the Temperon to use it, but Lyena, terrified at that option, captured the Fifth Doctor and hooked him up to a life extraction unit... unfortuantely for her, not in time for the Temperon to be prevented from revealing the truth about the Sirens to The Doctors. The Sixth and Seventh Doctors were left with a terrible conundrum; if they did what Lyena asked of them, they would have responded to the Siren's call twice (Evidently it didn't control them after their regenerations) and would become the Sirens' eternal slaves, going all over time causing chaos, but if they refused, Lyena would kill the Fifth Doctor, thus erasing the Sixth and Seventh from history and causing even more chaos for the Sirens to feed on. There was only one chance; by freeing the Temperon, The Doctors would give the Temperon the chance to stop the Sirens, but only by condeming it, and the Sirens, to eternal struggle. 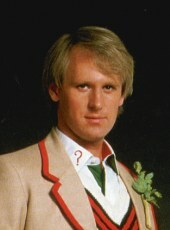 Lyena was sure that The Doctor's innate compassion would force him to seek another solution, but she made a crucial mistake by bringing three Doctors together; each time The Doctor regenerated, certain aspects of his personality come into greater prominence than in other incarnations, and while the Fifth Doctor may personify The Doctor's compassion more than others, and the Seventh his knowledge, the Sixth was far more... pragmatic than his other selves. He thus destroyed the restraint field machinery, setting the Temperon free to correct history.